PMA’s technical sessions allow attendees to learn from leading industry experts, exchange best practices and explore new technologies. 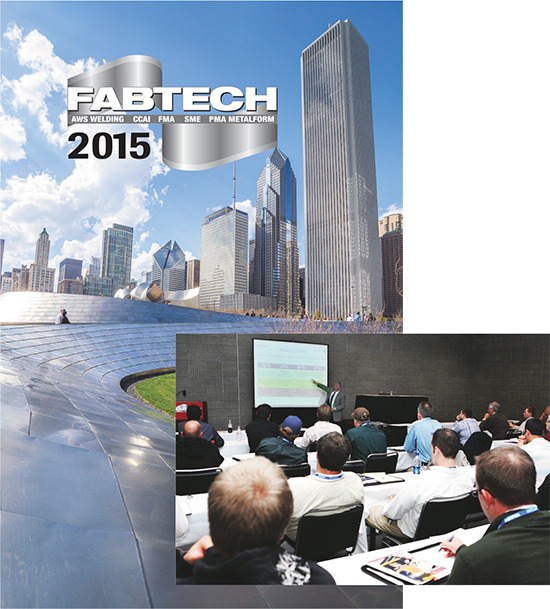 Here we present highlights from PMA’s metalforming sessions scheduled during FABTECH 2015. This presentation will discuss and define specific mechanical properties relevant to computer simulation of forming processes, and introduce the fundamentals of material-behavior modeling as required for simulation. Learn methods to predict and address sheetmetal springback during design and engineering, such as finite-element analysis, and define reasonable expectations of springback prediction and production stamping-process repeatability. As manufacturing has evolved so has the need for updated maintenance procedures and record-keeping. This presentation will discuss methods to make your press-maintenance process lean by reducing costs and increasing overall effectiveness. Learn how to use existing press systems such as tonnage monitors, brake monitors, lubrication systems and die protection as effective tools to monitor overall machine condition. This presentation will address common misconceptions and challenges regarding aluminum stampings, while providing process guidelines and practical solutions. Topics include product design guidelines, material selection, tool-steel and surface-coating selection, establishing proper punching and cutting clearances, and lubrication selection. This presentation will touch on the latest advancements in servo technology not only in traditional mechanical-press applications (transfer, blanking, progressive, tandem and asymmetrical presses), but also new advancements in hot-stamping technologies moving to mechanical servo. This presentation will address servo technology, enabling users to rethink the way they design their processes, tackle the challenges of higher-strength steels and other advanced materials, overcome part-quality problems, and reduce issues regarding press wear. Attendees will walk away with a better understanding of how to improve their processes, overcome current and future challenges, and optimize efficiency from their investment. By combining the fastener-installation process with the stamping process, the secondary operation of fastener installation can be eliminated. This increases productivity by improving throughput, reducing costs, reducing WIP and increasing quality. A full description of the individual elements of an in-die system and how they function together to form a complete system will be reviewed. This multimedia presentation includes detailed graphics, functional animations of the internals of the die tooling, and photographs of typical and unique projects. Multiple case studies with videos and samples of customer parts will be presented in a wide variety of applications, such as deep drawing, coining, punching, ironing, powder compaction and assembly. This informative presentation will explore the following core metalforming technologies: basic deep-draw technology including programmable cushion functions; high-speed servo hydraulics; quick die change; press automation including automated blank handling, servo transfers, indexing and robotics; and in-die sensing and data acquisition including OEE tracking. Jon Schmidt and Jon Boardman, Neff Press, Inc. In this session, participants will identify common sources of variation in the stamping environment and relate them to the common inputs and assumptions made during the engineering process and stamping simulation. Participants will be introduced to methods and practices that can inform engineers as to the repeatability of the simulation results in reality and validity of the computer simulation. This session introduces attendees to the basics of in-die sensing for die protection. Starting with an overview of the many types of sensors commonly used for die protection, attendees will learn how to select and properly apply the right sensor for any application. Using real-world examples, the advantages and limitations of each sensor type, as well as tips and tricks on sensors selection, installation and wiring, will be highlighted. Newly developed AHSS grades have increased in tensile strength, and innovative processes have made application of these grades more effective. Further, 3G (gauge, grade and geometry) design optimization has been applied to generate significant mass and cost savings. This presentation will review current production examples of lightweighting of body sheet components using these new technologies, which were first introduced in the FSV program. This session will focus on the implementation of a serious die-protection and error-proofing program for metalforming and assembly companies. Included in this session will be the uses of electronic sensors for die protection, in-die part-quality monitoring and automatic self-adjusting tooling with servo motors. This presentation examines a number of different material types (aluminum alloys, high-strength steels and stainless steels) commonly used in commercial, automotive and aerospace products, and the effect they have on the stamping process. Guidelines for designing dies, selecting pressroom equipment, and implementing appropriate die-maintenance routines based on specific material properties and their influence on the stamping process will be discussed. Stamping dies for AHSS applications face a variety of challenges, including galling of the surface of drawing dies and cracked cutting edges of trim dies. At the same time, stampers must prepare dies quickly and efficiently to satisfy the timelines of new model launches. This session addresses solutions to these challenges, including new die materials, coating technologies and tooling technologies. For management, quality engineers and supervisors in stamping operations, part quality can be a source of frustration. Teams need to identify quality issues early and adjust quickly so that they can have zero defects shipped to customer. This is readily accomplished through in-die process validation, electronic measurement and part tracking. Through real-world examples, we will discuss how press shops are successfully implementing 100-percent inspection of finished parts regardless of automation level. Lubricants can make a major impact on the success or failure of a stamping operation. Understanding the different compositions available and how to best apply them to specific operations is important, to ensure the greatest success rates and process compatibility. Not all lubricants are created or perform equally. Determine how to evaluate different lubricants during a trial, learn industry best practices, and understand important metrics for overall success and improvement to the bottom line. Steve Lowery, Tower Oil & Technology Co. Learn how extreme-pressure additives affect the workability of stamping lubricants. This session will cover the future of metalforming lubricants, government action on chlorinated paraffins, understanding the global regulatory system and the use of extreme-pressure additives in metalforming lubricants. This presentation will explore the relationship between installation methods and their effects on machine productivity and the surrounding environment, using technical illustrations and case studies. The characteristics of a wide variety of isolators and mounting systems will be covered including elastomeric (rubber) and steel-coil spring systems. Providing a risk assessment allows employers to meet the requirements of OSHA’s “general duty” clause (5A1 of the act), which requires employers to keep the workplace “free from recognized hazards.” This presentation will provide guidance on the process and steps for performing a risk assessment for the overall safety of stamping machines, and to assist in the application of OSHA 1910.147 control of hazardous energy. Also explained are the additional benefits to be gained as a result of upgrading production equipment for use with alternative control measures as they apply to the control of hazardous energy. Eddy-current and variable-frequency drives have been employed for many years to provide variable speed control for machines. This session focuses on applications for mechanical metal-stamping/metalforming presses, and argues that eddy-current drive technology best serves applications for presses.